When it comes to sustainability, wood is one of the best materials imaginable - but only if it is grown in properly managed timber estates. The ships of old were built of wood by skilled craftsmen. Carpenters make furniture from wood. Wood is lighter the steel as a structural component but being a natural product is limited in size. About 45% of the UK's CO2 emissions come from buildings. The Climate Change (Scotland) Act 2009 aims to reduce emissions by at least 80% by 2050. In Scotland, sustainability of buildings is embedded into the building standards. These standards are constantly being increased. The Sullivan Report made recommendations to achieve total-life zero-carbon buildings by 2030. As the expected operational performance of buildings increase, the environmental impacts of the construction materials used become more significant. These impacts include; the use of raw materials; transportation, the resources used in manufacturing, and the emissions generated. For timber products embodied carbon is an important green credential. For a comparison of materials see the Inventory of Carbon and Energy prepared by Hammond and Jones of the University of Bath. Timber captures and locks CO2 up, to a limited extent combating greenhouse gas build up. While is is growing, forests generate oxygen - and that is why we cannot afford to lose the Amazonian Rainforests. Trees absorb carbon dioxide as they grow while simultaneously providing biodiversity rich habitats for wildlife, a variety of ecosystem services and leisure spaces for local communities. Timber is the only mainstream 100% renewable building material. Far from depleting natural resources, increased demand for sustainable timber increases demand for sustainable managed forest to provide it. It is a win-win situation. The choice of sustainable materials is not the whole story however. Building design, process and quality are also important determinants of how well the building performs - as is the way in which it is ultimately used. *Using timber in construction improves the sustainability of buildings. The Forestry Commission in England supports the use of sustainable timber in construction and as a source of renewable energy. This website will allow you to find out more about Forestry Commission projects that use locally grown sustainable timber and about how they promote timber as a renewable and sustainable material. Pre-historic and historic clearance of our woodland led us to a low point at the beginning of the twentieth century when woodland was only 5% of Britain – and falling. It is now nearly 12% - and rising. Through creating this major new asset, we can be sure of handing on to future generations something better than we inherited. We have put sustainability at the heart of our forestry policies and practices so that we can realise the full potential of our woodlands as economic, environmental and social resources. Where improvement is required, it is our responsibility to guide and encourage the changes – and to fit them into the international commitments that we have made on sustainable forest management. 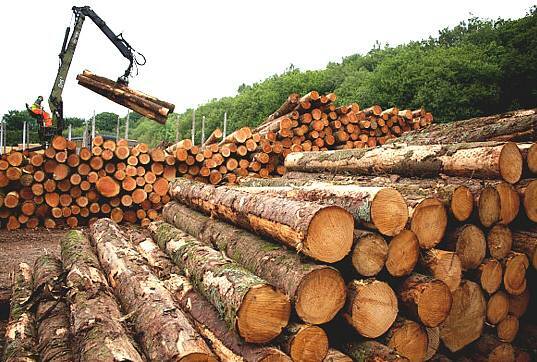 The development of the timber industry, using wood from Britain's forests, has been a major success story. As a result of major investments in processing capacity during the last 20 years, the industry has been independently estimated as providing over £7 billion annually to UK GDP, and directly employs some 167,000 people in growing, harvesting and processing trees across the UK. TABLE ASSEMBLY - The underside of the 18mm plywood was marked out with centerlines and leg mounting distances. The old pine planks were laid onto the plywood and clamped tight, then screwed to the plywood. On top of the pine, the 24mm x 610mm x 203mm hardwood ply pads were laid and the legs screwed through the pine planking to the 18mm spruce table top. Be careful to use the right length screws. They should be tapered steel wood screws, with the holes pre-drilled to avoid splitting the wood. This gives a stronger fixing than when screwing straight into the wood with modern chipboard screws with no taper. A USEFUL WORKBENCH - Well, there it is. A very versatile workbench made from recycled materials with just another £24 for a new plywood top and £3 for some steel hinges. The screws were already in stock, but had you bought them, would have cost another £2. Total cost including paints will be in the order of £40. You could not buy such a string table for under £200 in the shops. It pays to DIY. Don't forget to bevel all edges and sand off any rough grain before sealing the wood with a good preserver and water-proofer. 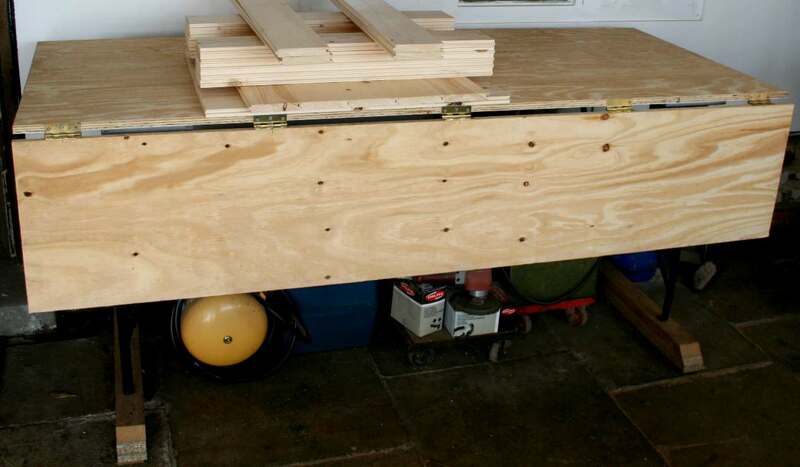 The table is shown here carrying softwood planks to be used to make solid pine cabinet doors. The leftover plywood will be used to make a DVD/Bluray cabinet.